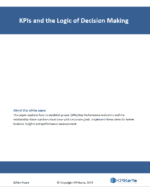 This paper explores how to establish proper Key Performance Indicators (KPIs) and the relationship those numbers must have with corporate goals. Implement these ideas for better business insights and performance measurement. 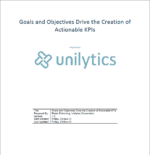 Goals and Objectives Drive the Creation of Actionable KPIs. KPI creation has always been a difficult task for many organizations and the KPI Karta has been developed as a best practice to ease the chore of KPI derivation. 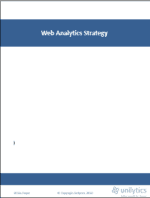 KPIs drawn from the KPI Karta quickly convey how a business activity is performing and how successful an overall website strategy is. Today, your web site needs to be like any other business expense; accountable. It doesn’t matter if your site is intended for ecommerce, government, non-profit or media, all sites need to have their funding justified. Web sites have become critical forums.